We Have a Winner! "The Squirrel Works" takes home first place for an aerospace engineering project -and a check for $1,000: (from left) Erica Hulette, Emily Paxton, (back row) Wesley Gillman, Kyle Neville, Jared Mehnert, and Fahraan Badruddin. See the slideshow from the 2018 Capstone Expo. 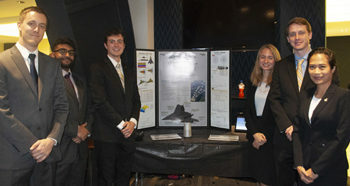 More than a dozen Daniel Guggeneheim School of Aerospace Engineering teams put their skills to the test for the December 4 Capstone Expo, held at the McCamish Pavilion. 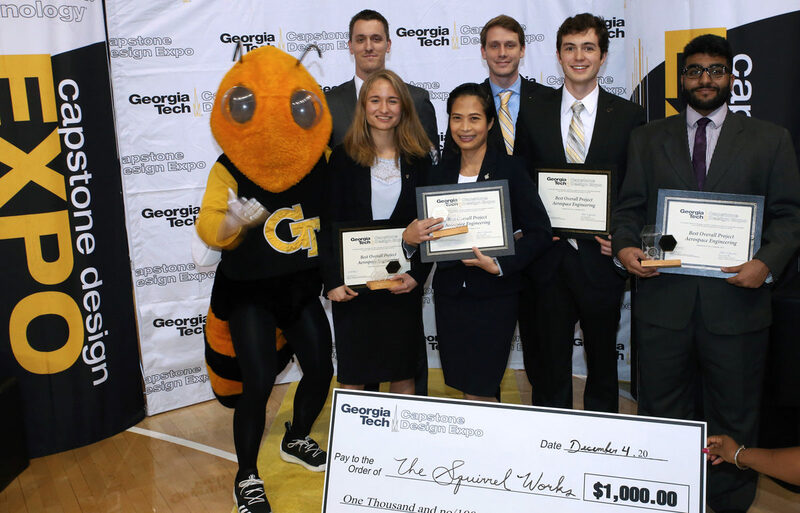 Twice a year, the Georgia Tech Capstone Expo tasks students from throughout the Institute to solve real-world problems in their respective fields of study. This year 153 teams from seven schools competed for the top prize, $3,000. Prizes were also awarded to the best projects within each school. Bringing home the top aerospace engineering project was team, “The Squirrel Works”, which designed an unmanned supersonic long-range aerial vehicle. “Through our designs and analysis using Simulink, we were able to create a more cost effective and efficient aircraft to replace the F-111 and F-117” said Squirrel Works member, Wesley Gillman, an Arkansas native. Design an unmanned long-range stealth strike aerial vehicle to replace the F-111 and F-117. Design a SmallSat mission to rideshare with an existing NASA mission. Design a two-member family of light aerobatic sport aircraft according to the IAC intermediate category requirements. 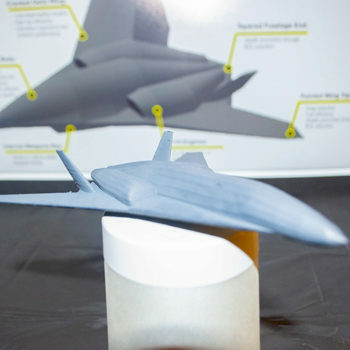 Squirrel Works' winning design presented a more efficient, lighter aircraft that could reach super cruise altitude more efficiently, reduce the airfield size in half, while also having a more optimized combat radius of 3,140 nautical miles. When asked what the team of six would do with the prize money, Erica Hulette predicted that the funds would go to something important for all of them – groceries. Another AE team, DustSAT chose NASA's SmallSat rideshare option to look into the atmosphere of Mars and better understand dust storms. Team members explained that, unlike Earth, which has more regional, smaller-scale storms, Mars has global dust storms. “If we can better understand and predict these storms we can extend the life of man and unmanned missions on Mars,” said Christopher Scank. DustSAT used radiometers to detect changes in the atmosphere - temperature, pressure, and movement - and cameras to spot visible dust storms. 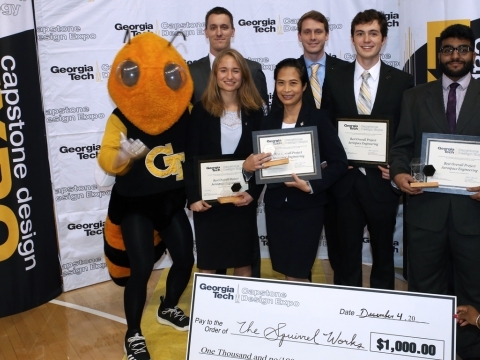 The $3,000 prize for the best project overall went to Supleurative, from the School of Biomedical Engineering, which designed an efficient, reusable, and low-cost lung drain device that is fit for use in developing nations and can replace the current gravity drainage used at Ethiopian hospitals. Threading through the crowd of 150 judges was AE's own chair, Mark Costello. "Capstone is really where we see the best of what we do," he said. "The innovation and the hard work are obvious, not only to me, but to future employers." Couldn't make it to the expo? Here's a list of all the aerospace engineering projects.